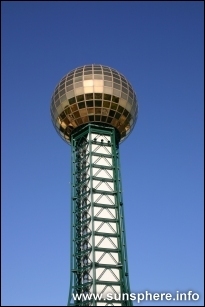 The Knoxville Sunsphere was the theme structure for the 1982 World's Fair. It represents the sun, source of energy, and reflected the energy theme of the fair. There is also a mechanical level at the top for elevator and HVAC equipment. There is a transition level at the base of the sphere that integrates with the tower. There are two 418-step fire stairs and three high-speed elevators contained in the tower. During the period of the World's Fair, the tower's color was blue to match the color of the sky. The current color of the tower is forest green. 24-karat gold gives the panes of glass the reflective gold color. The panes of glass have vinyl film impregnated with gold dust laminated to them. There is an insulating airspace between two pains of glass in each window section (one interior, one exterior). The top half of the sphere's outermost pane is tempered and the inside paine is laminated The bottom half of the spehere's outermost pane is laminated and the top half is tempered. This is why the top half of the sphere is not as reflective. Each plane of glass cost $1,000 on the average at the time of construction. During the period of the Worlds Fair, the restaurant was managed by Hardee's. The menu was greatly different from the fast food restaraunts. If you have a menu, please email e-mail us.